A type housing or keyed joint where one member has a wedge shaped end set into a similar shaped recess. 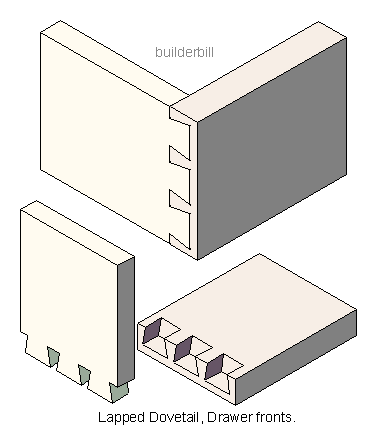 The standard or Common Dovetail that joins two pieces of timber. More often than not the pieces are the same thickness. Working by eye or by memory the beginner nearly always makes his dovetails with too much angle This causes corers to split off as the joint is being assembled. The correct angle for a strong and pleasant looking dowvetail is 80 degrees, hich can be approximated as a ratio of 1:6. The number of pins and sockets is up to the cabinetmaker, and any number from only one to many can be made. When a dovetail jig and a router are available then the size of the pips is usually fixed, and the back edges of the pins and the bottoms of the sockets are left semicircular off the router. 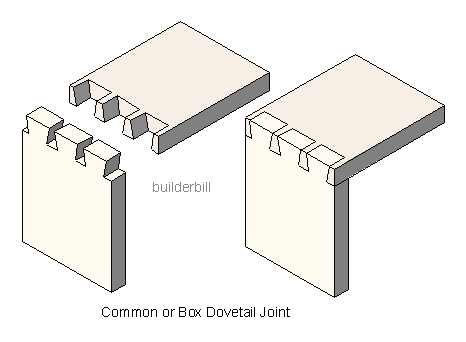 The Lapped Dovetail shown above is a variation that is used for drawer fronts where the front face does not show anything of the joint. It would be fair to say that the construction of dovetails and drawers go hand in hand. The shape of the joints resists the pulling force applied when heavy drawers are pulled open. 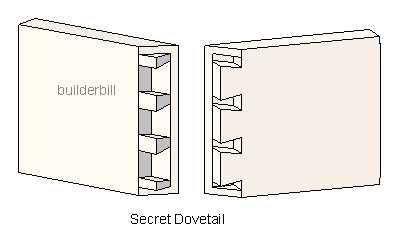 When there is a requiremnt for the strungth of a dovetail but without it's appearance the the Secret Dovetail is and option. There are many variations of all the basic woodworking joints and above is a combinations of a halving joint and a dovetail. 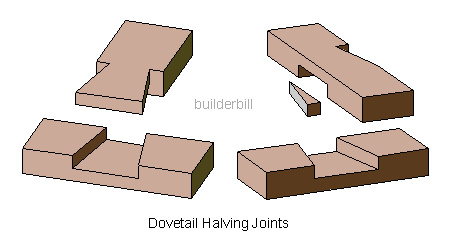 The Dovetail Halving. Another dovetail variation is on the next page.